Early american folk art doll. This unique doll is very special. She is made ca 1860-70 She is a black doll with negroid face, Her head is wonderful sculptured in papermache with fine molded features fine painted eyes, modelled eyebrowns and mouth. A few hair is set ino her chin Her head is a swiwel head on a very special body made of leather over wood. Moveable arms with detailed fingers, Modelled breast,ribbons, detailed hands and feet and body features. Also the back is so lifelike! She is a very special doll with a great appearence. She is without clothes.She came with a clothes over her lower body, which was later made. 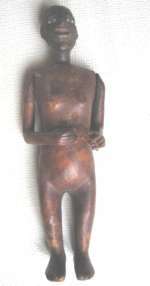 But it will come with the doll.The doll comes with a provenance.Size 22 cm/ 8 1/2". A very special doll for your collection of early American folk art or early papermache. This doll seems unique to me! Americana. Rare old pair of Rag dolls. Old character dolls. Artist made in Scandinavian. ca 1900. All original.Very charming couple of Folkart dolls. Size cm 24 x 33 ( 13" x 9 1/2" Excellent condition. Rag dolls-Folkart. Scandinavian ca 1900. Rare old pair of Rag dolls. A man and a woman farmer couple on a bench with their foods. Old character dolls. Artist made in Scandinavian. ca 1900. All original.Very charming couple of Folk art dolls. Size cm 24 x 22( 9 1/2"" x 9 " Excellent condition.